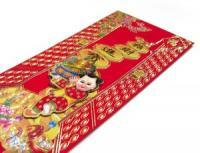 Plan several Chinese New Year activities to keep guests entertained at a Chinese New Year celebration. Unlike other American New Years traditions, this holiday is celebrated according to the lunar calendar, not the Western calendar. The 15-day celebration can take place anywhere from mid-January through February. Attending an informational cultural event is great for Chinese Americans and other Americans who want to learn more about the country and its traditional beliefs. For more images of the New Year... watch this slideshow! Immersing oneself in Chinese New Year activities does not mean one has to venture outside the home, especially in cold climates. Instead, plan New Year's Eve parties for one of the nights of the Chinese New Year celebration. Although the last night is often the most popular for parties, consider hosting one during the week that is themed around what that particular day in the Chinese New Year represents.Superstitions surround the holiday, often having to do with luck. Before the last day of the Chinese New Year, it is important for many families to follow a particular cleaning ritual. Cleaning and sweeping out the house is necessary to usher in the New Year. Take care not to sweep the pile of dirt out the front, as that may mean sweeping out any good fortune, or even family members, with it. Instead, put it in the center of the home and take it out the back door. Once the ritual cleaning is finished, the home is now ready for any parties and activities to commence. 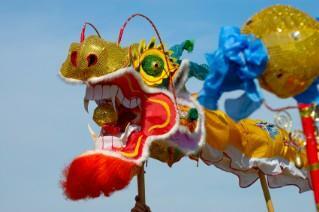 Each year of the Chinese calendar is assigned one of twelve animals. Help guests learn which animal represents them. Follow up with a craft or game that relates back to the animal of the upcoming New Year. For example, 2009 will usher in the year of the Ox. Play kids' games like "pin the tail on the ox" and make origami ox head ornaments for adults to display in their homes. The seventh day of the Chinese New Year is considered "everybody's birthday." Unlike Americans, traditional Chinese do not celebrate the day they were actually born. Instead, everyone simply adds a year to his or her age on this day during the New Year celebration. Throw a party on the seventh day of the Chinese New Year. Have birthday party supplies on hand, like hats, balloons and streamers. Pick up or make a generic birthday cake with a candle everyone can help blow out. In fact, a small white elephant gift exchange, similar to a Christmas party gift exchange, could even be held, so everyone gets a "birthday" present to open. High schools and colleges across the country often host foreign exchange students. Reach out to an international student or family during this important celebration. Invite them to speak with guests about their heritage and culture during a dinner hosted on Chinese New Year. No matter how a family chooses to usher in the Chinese New Year, members are sure to find plenty of activities that enhance the holiday's traditional meaning.